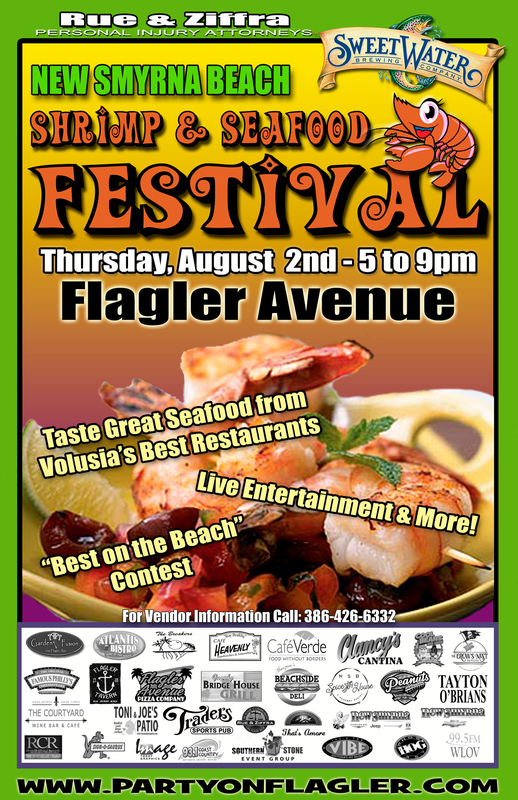 Join us on Flagler Avenue for the 11th Annual New Smyrna Beach Shrimp & Seafood Festival from 5 to 9pm on Thursday, August 2, 2018. The event will include all the best restaurants in New Smyrna and its surrounding areas serving up sample sized portions of their award winning seafood dishes all priced between $3 and $5 plus local artists, musicians and other “Seafood” related activities. During the Festival, restaurants will be competing for the coveted “BEST ON THE BEACH” awards in 4 categories, Shrimp, Shellfish, Fish and Specialty Seafood. This is a great opportunity to try out our great local cuisine and perhaps find a new favorite dish or local restaurant.